The Fire Ball swings back and forth at my Chicago carnival, as the glassy-eyed Flying Dumbo turns in twisted circles. I don’t know why I even remember the off-hand conversation on set-up that Sunday in Marlboro, New Jersey but it struck me that the grease covered storyteller had no sympathy for Ghost, as if Ghost deserved to be shot. Which also seemed like a lesson of carnivals in general. Earlier this month, I hitchhiked from New York/New Jersey to Chicago and was working a carnival in Gage Park, next to Humboldt Park, the most violent neighborhood in Chicago. We were at the Chicago season opener for this carnival at 55th and Western, a longtime dividing line between the Latino gangs and the Black gangs. There’s enough tension at this jump that at least one of the security guards carried two holstered guns on his hips and another pistol hidden on his person. CHICAGO — Two people were killed and nine others were wounded in shootings over about nine hours Wednesday evening. A 15-year-old boy was standing with another teen in the Gage Park neighborhood when he was gunned down Wednesday, police said. In the midst of this season of murders, along a gang fault line, I focused on running the Dumbos. Dumbo the Flying Elephant is a ride with a two-seater car attached by arms to a center, where another Dumbo is perched high on a spinning pole. In the Disney cartoon, Dumbo’s big ears are his wings. The ride is supposed to rise up and give kids the feeling they are flying on Dumbo’s back. It’s a common and popular ride, made by one of the biggest manufacturers of carnival rides in the world – Zamperla Amusements, Vicenza, Italy. Still, parents like to comment on Dumbo’s glassy eyes and half-witted smile, which makes Dumbo look very, very high. 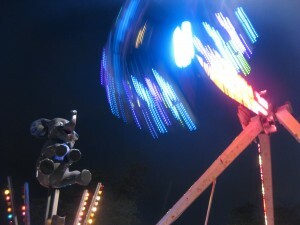 Or as they say on the midway, Dumbo looks like he’s flying twisted. One night I heard someone call out to a Ghost and I wondered if I had found him. Before the evening lines started to form that night, I waved over Marine Eric as he walked by the Dumbos to the donikers (carnival lingo for port-a-potties). I asked him if the carny running the balloon game was really named Ghost. Ghost, he said, was once known as Bo Bo The Clown when he worked the dunk tank. I later heard several carnies talk excitedly about Bo Bo The Clown, as if he was an artist of the insult. Bo Bo knew just the right dig, or jab, or verbal slap to get people to step up to the line and throw a ball at the target to sink the hated clown. “Bo Bo was the greatest ever, no, maybe Ghost is better,” one carny said, who I think felt sorry that Ghost had to change his identity. Nicknames in traveling carnivals stick like someone’s identity. It says something about the person, just like the job they do defines them. That’s why a carny feels proud if he/she is working the Giant Wheel vs. working the Nemos in kiddy land. Still, carny names can mock. A carny in Chicago got the nickname Sugar Lips. One in New Jersey was Dummy. Bo Bo The Clown was unmistakably a show name, a persona he put on when he worked. But carnies work seven days a week during the season. Ghost is different. He doesn’t play the tank. Something happened, he isn’t that guy anymore. With a supernatural name like Ghost, his girlfriend could only be named Angel. Angel rolled a souvenir cart around the Gage Park carnival, selling cheap, loud items including the multi-colored flashing dolphin necklace I bought for my daughter. Angel is pretty, blonde and in her twenties. 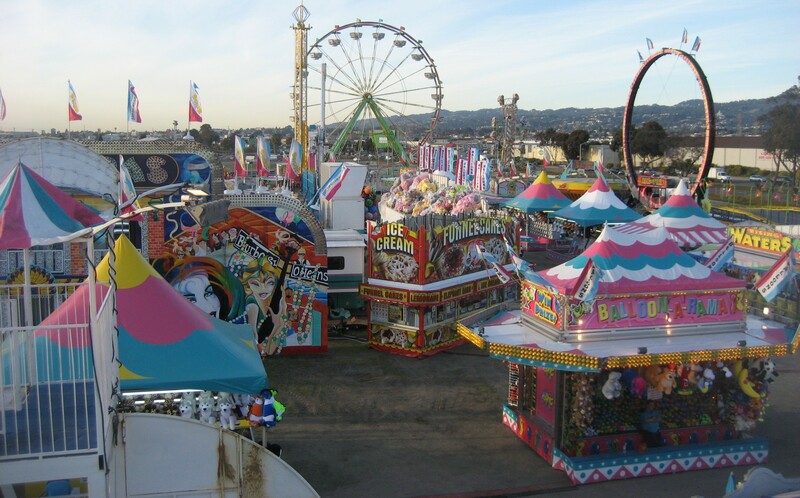 When talking to her, it occurred to me, that many traveling carnival workers have a similar dream: hitting it big – coming back to the carnival to own rides or shops – acting the big shot. Ghost is tallish, thin, with black curly hair that comes out the back of his low-on-his brow cap. He looks like a young version of playwright/actor Sam Shepard. Both Ghost and Angel wear shirts with the Hatchet Man, the logo of the band Insane Clown Posse. The Hatchet Man is an outline of a wild-haired man running with a cleaver, ready to strike something or someone. I didn’t ask them, but, often people wearing those shirts are fans of ICP and believe in the Dark Carnival. After all, band co-founder Joseph Bruce said traveling carnival workers visited him in a dream and showed him the Dark Carnival. In the Dark Carnival, all the dark rides and dark amusements send damned souls to hell. Ghost and Angel were talking when I went up to them during a short break. “I heard there’s another Ghost on the East Coast,” Angel said. Then Ghost, lifted his low-brimmed hat. “I heard he was shot in the shoulder,” and I pointed to my left shoulder. Bo Bo The Clown, in full clown regalia, was taunting people from the dunk tank at a carnival in Tennessee when a young man took offense. He drew out a .22 caliber gun and began firing, hitting Bo Bo in the chest. It is so wrong, but I had a comical vision of a dunk tank clown squealing for mercy and splashing around as a hillbilly with hurt feelings hurls loud insults and blasts away. I wanted to ask both Ghost and Angel more about this violent, cathartic upheaval in their carnival lives but they got paid that Friday and disappeared in the night. What happened to Bo Bo wasn’t funny and those bullets literally made Bo Bo a Ghost. His vanishing act added to his lore around traveling carnivals. Someday, another carny will hear about him like I heard about the East Coast Ghost. Maybe he and Angel did get off the circuit. Maybe they caught a bus to another traveling carnival. Maybe they’ll both change forms again. This entry was posted in Uncategorized on June 28, 2013 by admin.